Note If you’re thinking of continuing my experiment, here are my thoughts. The below is the exact recipe I originally concocted and followed. Next time, I’d play with the kinds of sugar used (try 1/2 cup white, 1/2 cup light brown; or even 3/4 cup white, 1/4 cup light brown). 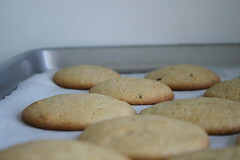 They were also not nearly as poofy as I’d like and the texture was not cakey, more tough and doughy. I might up the baking powder. 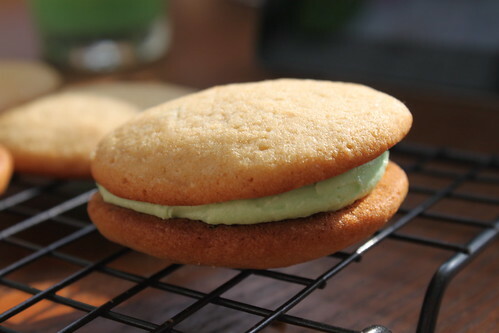 I also wonder if infusing the herbs in buttermilk (as the original whoopie pie recipe I adapted called for) might help the texture. You may also want to make a tarter filling, like cream cheese frosting, or even something citrusy, like a lemon buttercream, to counteract the sweetness of the pies. Good luck! Rinse and dry the mint and basil bunches well; do not chop these bunches. 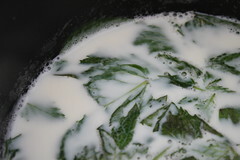 Combine milk and the herbs in a saucepan and bring to a simmer over medium heat. Remove from heat and allow to return to room temperature. 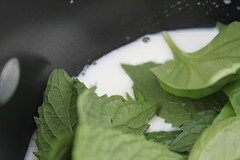 Once cool, strain herbs from milk, leaving your milk infusion. In a large bowl, whisk together flour, baking powder, baking soda, and salt. In another bowl, whisk together the milk infusion and canola oil. 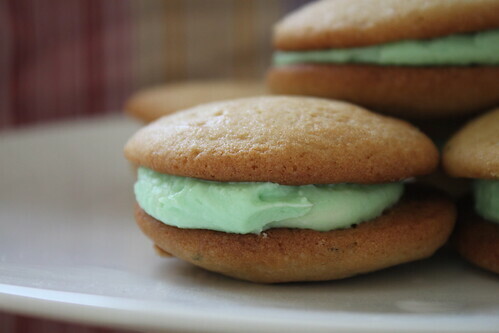 In a stand mixer, cream butter and shortening until smooth. Scrape the sides of the bowl with a spatula and add the sugars. Beat the sugars and butter/shortening mixture together until fluffy, about 5 minutes. Add egg, vanilla extract, and peppermint extract; beat until combined; scrape sides of bowl. Turn mixer to low and add the flour mixture, alternating with milk infusion, in three additions so that you end with the flour mixture. (So that’s flour – milk – flour – milk – flour.) Beat until just combined, scrape the sides. Add the finely chopped basil and mint, beat a smidge more until the herbs are incorporated into the batter, and stop yourself. Cover the bowl with plastic wrap and chill in the fridge for 15 minutes. 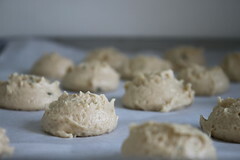 While the batter is chilling, preheat your oven to 350 degrees F and line two baking sheets with parchment paper. 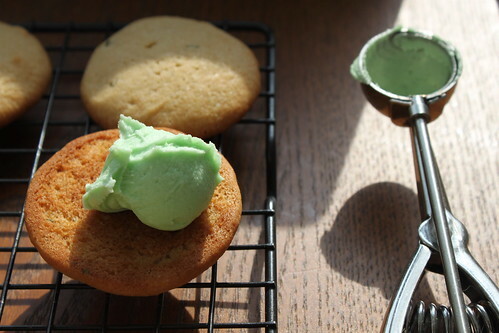 When ready, use a small ice cream scoop or cookie scoop (about a tablespoonful) to scoop batter onto prepared sheets, about 1 inch apart. Bake for about 13-17 minutes (check at 10, mine took 15-17), until top starts to crack slightly and a toothpick inserted in center comes out clean. Allow to cool. Beat butter until smooth. 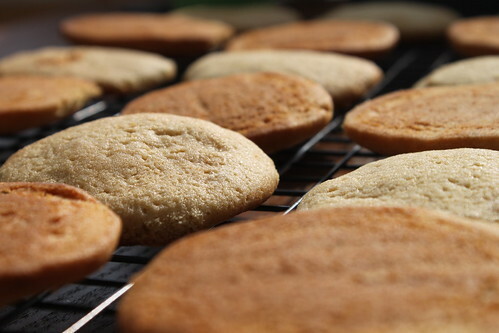 Add powdered sugar, vanilla, and salt; beat mixture until thick and smooth, being careful not to overbeat. 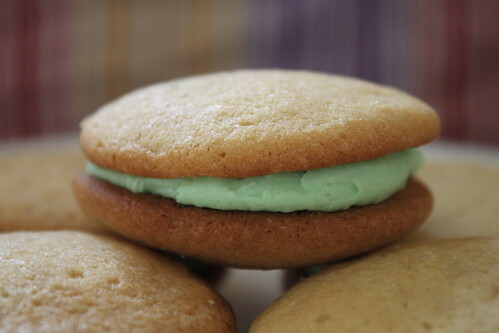 Add a drop of green food coloring, if desired. 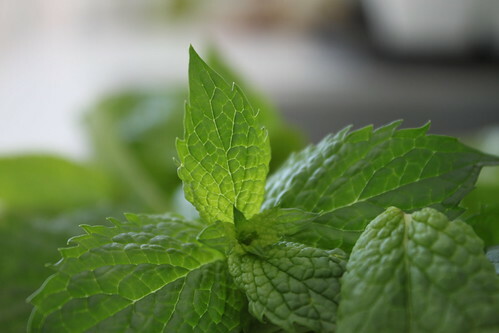 You could also flavor this with chopped mint or peppermint extract (only a few drops, I’d say), if you’d like things more minty. 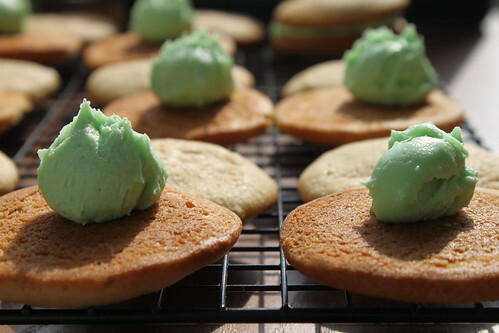 You could probably guess this–scoop about a tablespoon of frosting onto one of your cookies, then put another cookie on top. Done! Cover and refrigerate when assembled; keeps for about a week.